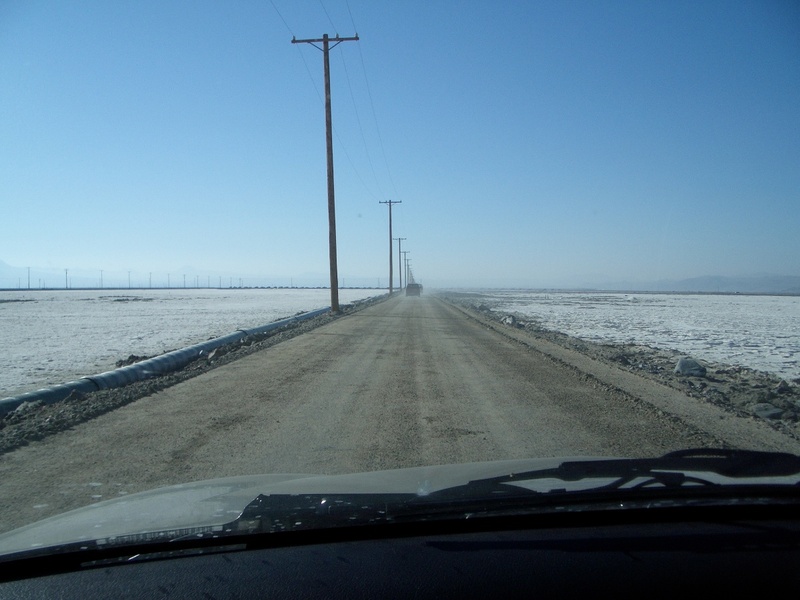 Searles Lake is a mostly dry terminal lake in the Mojave Desert east of Ridgecrest. A terminal lake is one in which there is no outflow – whatever water enters it must eventually evaporate. 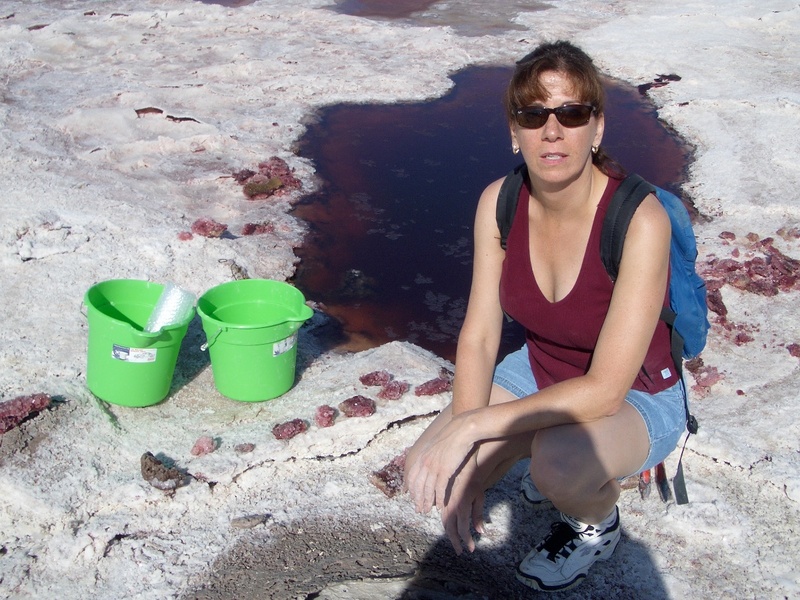 This evaporation has been occuring for over 100,000 years and has left behind a vast array of sodium, potassium, carbonate, sulfate, and other minerals in beds over 350 feet deep. Today, a huge chemical complex in the nearby town of Trona (actually, the chemical plant dwarfs the town) mines the lake bed by pumping brine into the ground and processing the resulting effluent. 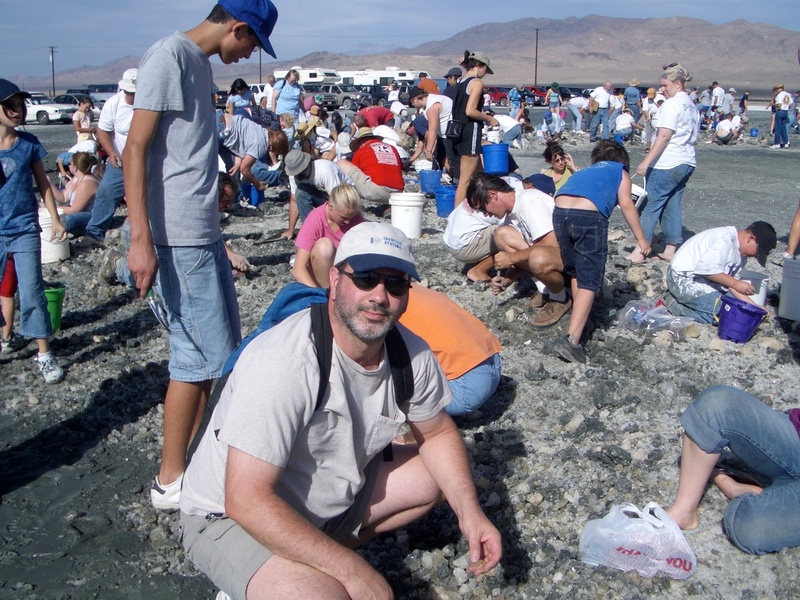 Once a year, the plant opens the lake beds to rockhounding enthusiasts for three unique collecting opportunities over a two day period. On the morning of the first day, everyone gathers to head out onto the lake bed. 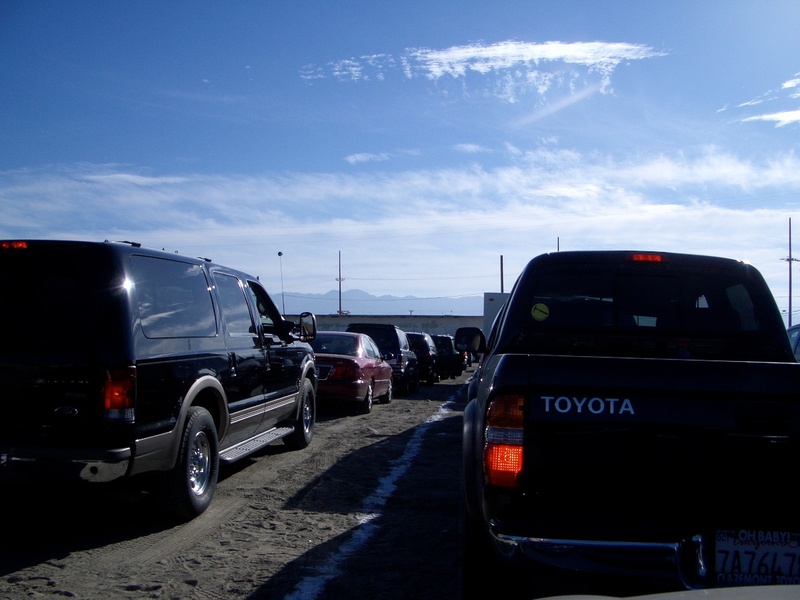 Hundreds of vehicles drive out single-file to the first activity – the Mud Bed. In this part of the lake, there is a thick, sticky, black, smelly mud that the chemical company digs up with a backhoe the day before. The mud is so nasty that only throw-away clothes should be worn. In the mud are crystals of Hanksite, both individual up to 6 inches and clusters up to several feet across. 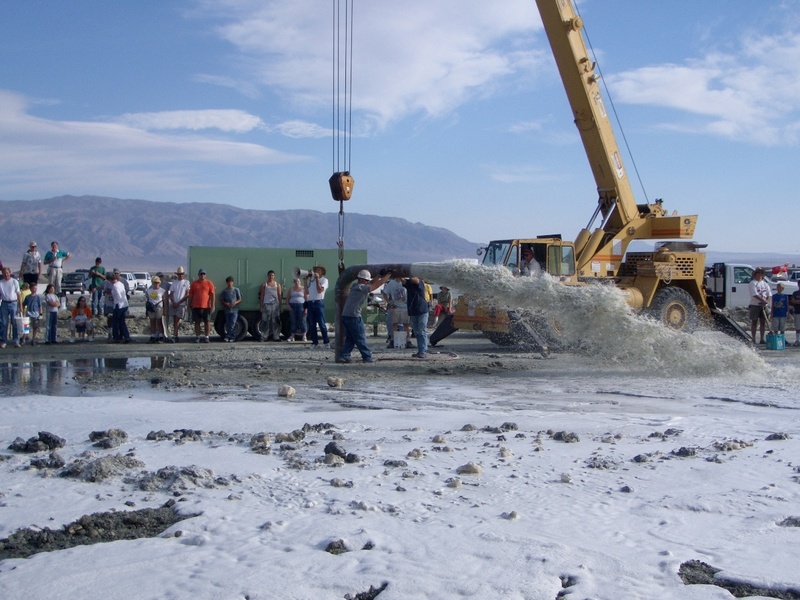 Hanksite is easily soluble in water, so the mud can only be rinsed off with brine from the lake bed. Long troughs of stinky lake brine are provided for this purpose. The afternoon activity on the first day is very differnt and held at a slightly different location on the lake bed. In this area, there is a layer of crystals about 50 feet down. 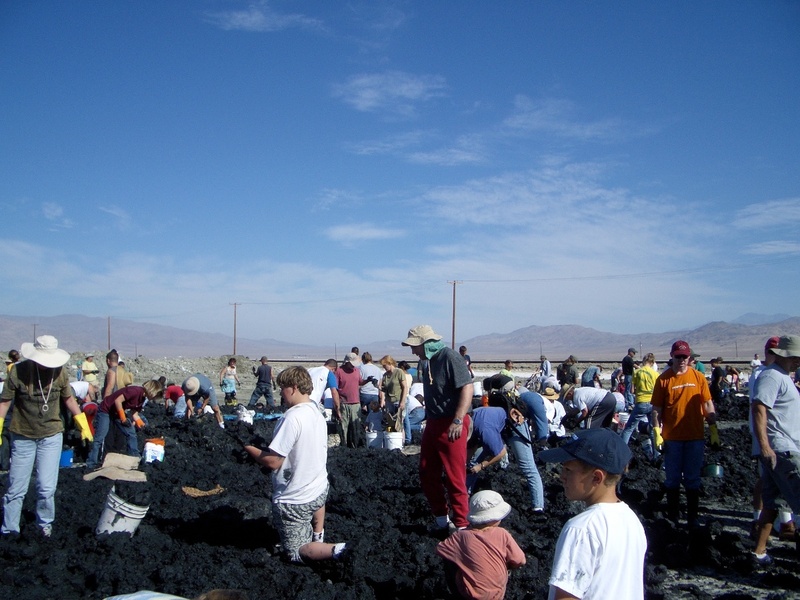 These include Hanksite, Trona, Halite, Sulfohalite, Borax, Northupite, and others. To get at them, a small hole is bored and then lined with expolsives. This craters a hole about 50 feet deep and a foot across. Large L-shaped pipes are then lowered into the hole and compressed air is driven down a small diameter pipe within the larger pipe. The result is a stream of brine shooting out of the L-pipe, carrying millions of small crystals with it. The result is a circular field surrounding each hole, maybe 100 feet across, and just covered with crystals. Yours truly sorting through the blowhole minerals. The next day, we headed out onto a different part of the lake bed. 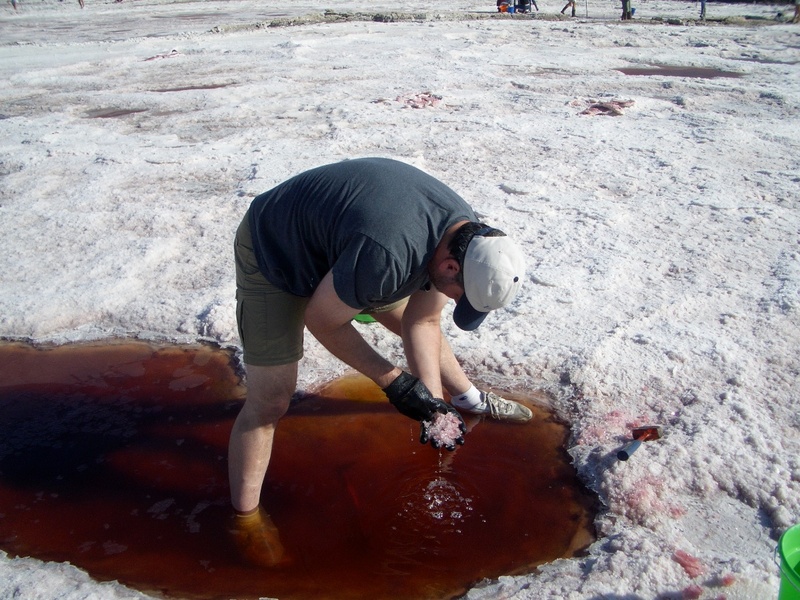 Here, there are many pools of brine hosting bacteria which color the water a deep purple-red. 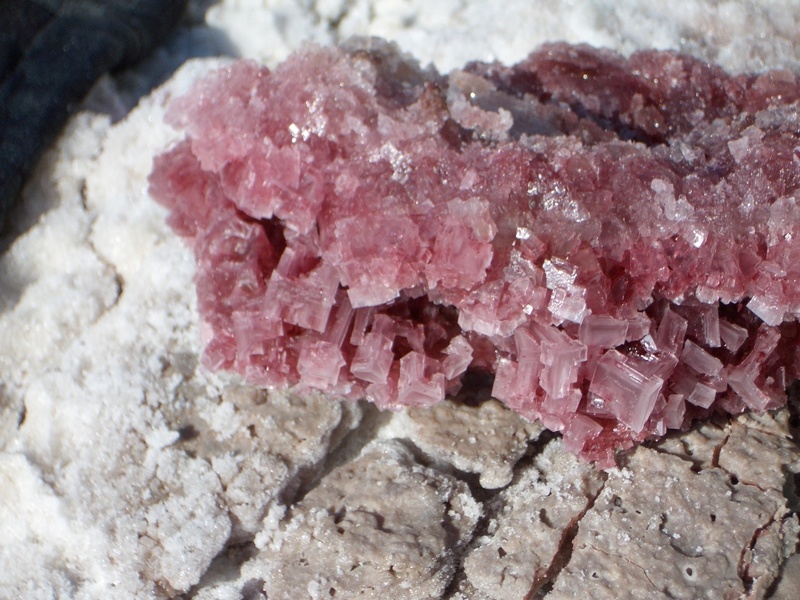 Halite crystals which form in this water trap millions of the salt-loving bacteria, resulting in pink Halite.